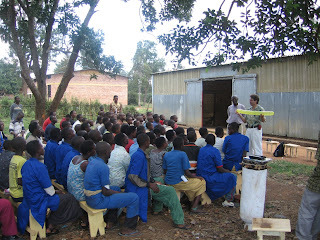 Rwanda Trip: From Paul - My Kind of School! From Paul - My Kind of School! From my earliest recollections in Sunday School, one story that has remained in my mind and heart was when children were surrounding Jesus. The disciples, considering the kids a bother, tried shooing the children away, telling them not to bother the Master. Jesus' response to the actions of his followers started out, "Let the little children come to me, and do not hinder them, for the kingdom of heaven belongs to such as these." Kids were HIGH on the Lord's priority list, so they should be on ours, as well. We paid a visit the other day to a unique school. It is for street kids. There is no orphanage associated with the school. The staff simply does what it can to rent homes for these children to stay in, and provide for their needs as much as possible. The school takes the kids through Primary 1, Primary 2, and Secondary. The children study Math, English, French, Kinyarwandan (their native tongue), as well as other subjects. They also have a workshop for the older kids, where they learn furniture making. The tools are all hand tools, except for the sanding. Since they have no sandpaper, they don't even use any hand tools - they use pieces of glass! During our visit the other day, we got to spend the better part of the morning with these kids - giving a message of hope, and our testimonies. I shared about my past addictions to drugs and alcohol, not knowing in advance how well it would be received. Two of the schools older kids stepped up and gave their testimonies, both of which included drug addiction! Now I know that my family of recovery is even bigger! More blessings like this visit are in store for next week - I can hardly wait! Keep us in your prayers, especially for our health and energy levels. Some of the sights here are incredibly taxing emotionally, and it's easy to get overcome. GUESS WHAT TODAY IS!! TODAY IS YOUR BIRTHDAY!!! Happy Birthday sis!! How does it feel to be 15! I love you and Happy Birthday. Have a fabulicious day! LOL! Love you! Happy Birthday to you, Happy Birthday to you, You're far away today - we love and miss you too! We are thinking about you all day today. WOW! How many people can say they had the chance to celebrate their birthday in a different country ... let alone another continent!! Brianna, are the birthday customs in Rwanda similar to those here in the United States? Do they make birthday cake there, too? Or, are there other special customs and practices? When you have a chance - post a blog to tell us what birthdays are like in Rwanda, please. Know that you are in our thoughts and prayers. Know that you are loved and missed greatly. All my love and best wishes on your 15th birday! Oooopppps - I typed to fast and mis-spelled birthday in the last line .... don't laugh at me too much!! Ooopppss - I'm a proof reading mess ... in my last post I should have written "too" not "to" ... oh well ... can you tell that it's summer break? I'm out of proof reading practice!!! HAPPY BIRTHDAY BRIANNA!! We can't believe that you are 15!! You are growing up so very fast. Don't you worry though, April and I will have cake and ice cream in your honor today! Today will not be the same here without you! We hope that you have a wonderful and blessed day today. Don't worry ... as much as April thinks that she has begun a new tradition of receiving your birthday pressents .... she is just wrong!! And remember .... six months until you get your driver's permit!! Woooo whoooo!! Love & Miss You Bunches!! Hope you had a good birthday. I hope you enjoyed your party. I can't waot to hear about all of your experiences in Rwanda. I hope you are taking lots of pictures and writing alot in your journal.